The rainy season is almost upon us, and right after that we will be faced with the depths of a humid summer. 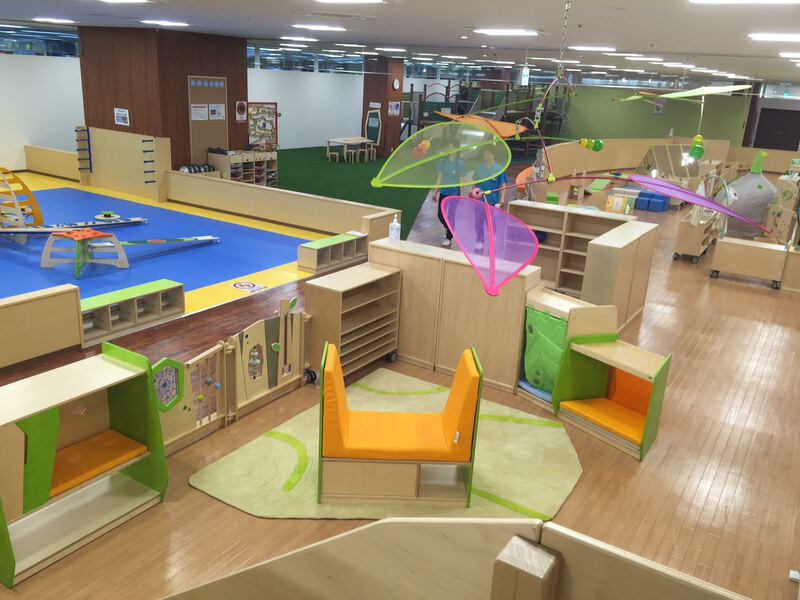 This to me signals one major thing – ideas for ways to keep children occupied indoors! 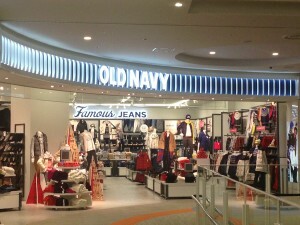 A new play center has opened on the third floor of The Mall on 16. 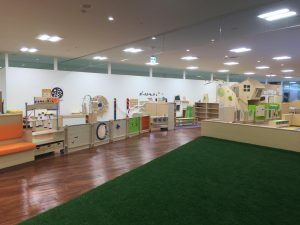 It is part of a chain of indoor play centers – similar to Bornelund at Aeon Mall. 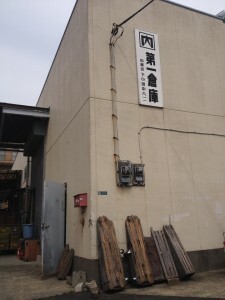 The name of the chain is Aneby Trimpark. 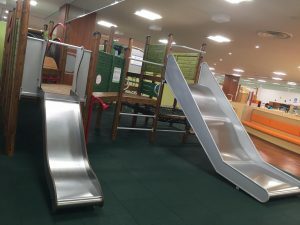 PRICE: It’s 800 yen for an hour of play for kids, with a 600 yen charge for adults – and a 200 yen extension for each 15 minutes after that, or you can get an all day pass for 1600 yen for a child with the 600 yen adult charge. DIRECTIONS: To get there, take a right out the terminal gate and simply follow the signs for Route 16. About 6.5km down the road you’ll see “The Mall” on your left. Parking is free, and then just head up to the third floor! Directions: It is a 15min walk straight out the Fussa gate passed the “Y” intersection on the left hand side, two doors before the German restaurant, Stuben Ohtama. 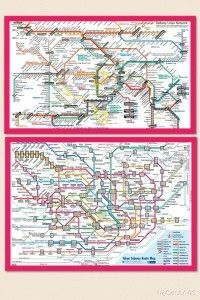 DIRECTIONS: Take the train to Harajuku station. 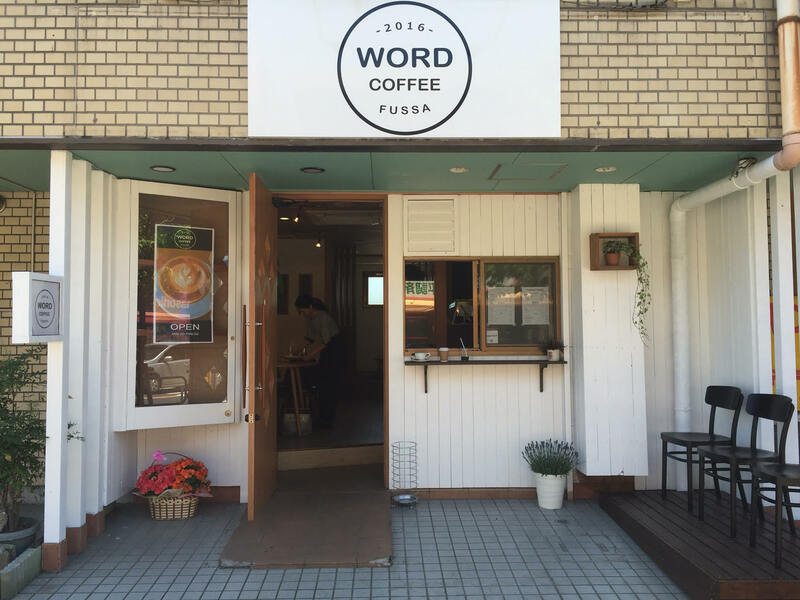 Yoyogi Park and Omotesando are a quick walk from the station. 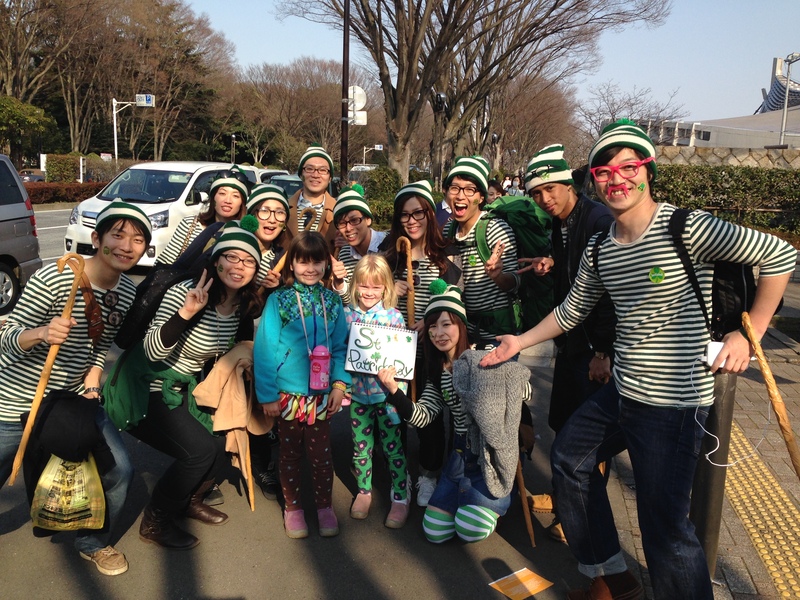 My daughter and I were looking for something to do, and of course Japan never disappoints. 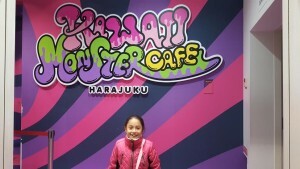 We went to Kawaii Monster Café in Harajuku, and what a treat it was! It all started with the friendly hostess, she informed us that there’s a Y500 per person table charge, then we got to choose a place to sit. 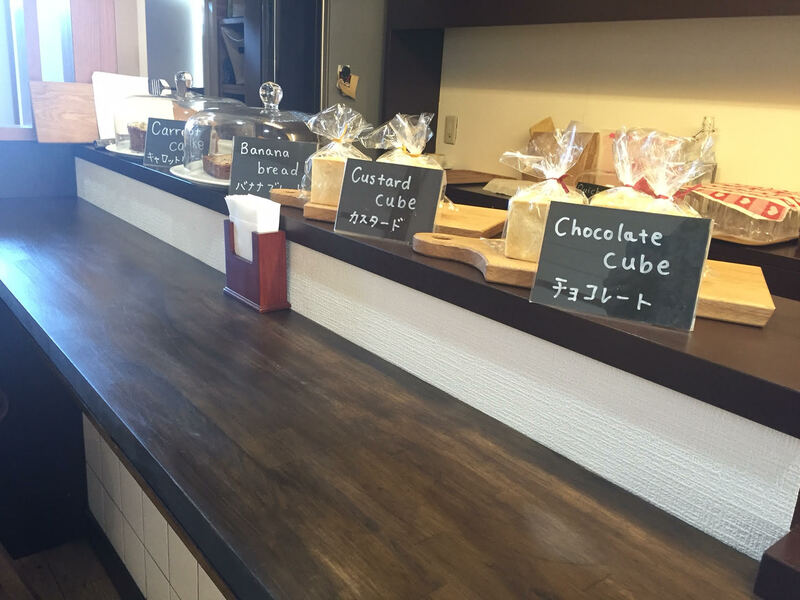 There are four sections to choose from, my daughter choose Mel-Tea Room. Once we were ready to be seated they have you wait by the door and say “you ready”? My daughter said “yes” and they opened up the door and WOW, all you see is nothing but amazing decorations all over the place. You feel like you stepped into a magical place. My daughter couldn’t stop smiling. Once we were seated they handed over the menu, which in itself was different. We only had dessert, but the food looked delicious too. 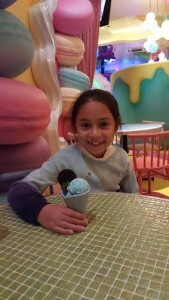 My daughter had the Monster Girl ( Nasty) ice cream. I’m not 100% sure if this always happens, or we got lucky, but when she ordered her ice cream a guy dressed in a tutu skirt and mid drift top with pink hair came to our table and started playing with her hair and tickling her. She got picked on by a kawaii monster! 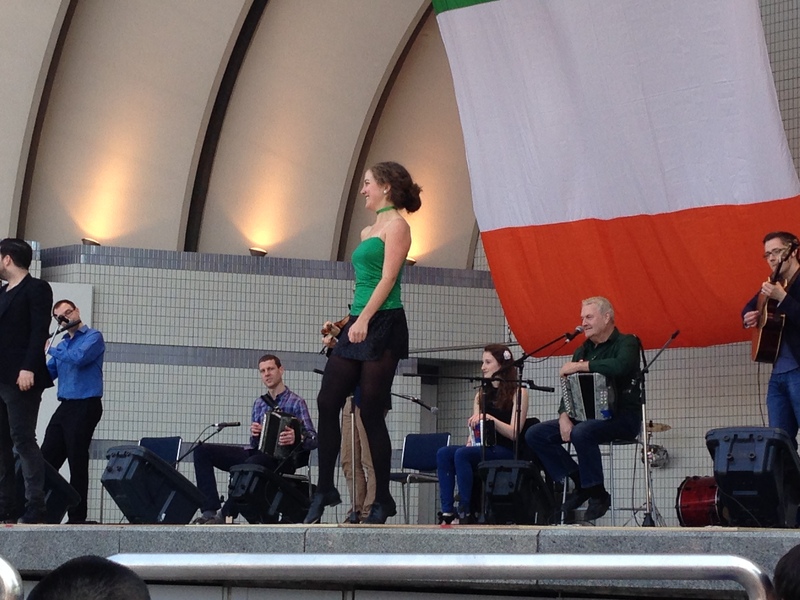 He did speak a little English and tried to talk to her, but my daughter was a little freaked. As for me, I couldn’t stop laughing! 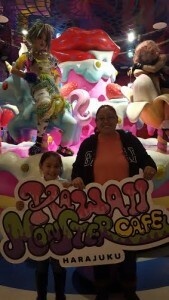 After all, we did come here for the kawaii monster experience, so if you don’t feel like getting messed with, you might not want to order the Nasty girl ice cream! As we were getting ready to pay, all the lights turned off and they said something in Japanese. I asked the hostess what was going on she said ” the performance was about to start”. I couldn’t believe our luck. 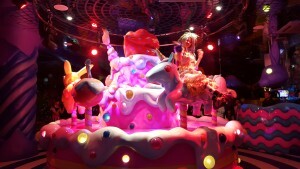 In the middle of the Café there was a merry-go-round that actually moved, and two kawaii monster’s where dancing around. 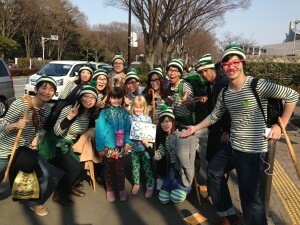 After the performance was finished we got to take a picture with them. Once we were ready to leave, a kawaii monster grabbed my daughter’s hand and escorted us to the exit where they have a small gift shop. 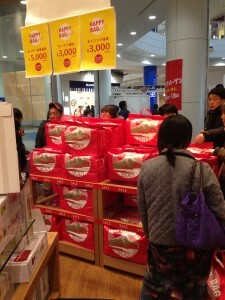 In total we spent Y2,480 for the entrance and two ice creams. 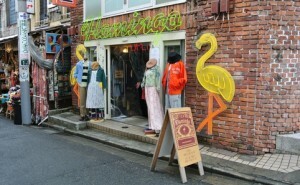 Directions: From Harajuku Station take the Omotesando Exit once you get to the major intersection make a left go all the way down until you get to the major intersection cross the street and make a left you will keep going straight once you pass American Eagle Outfitters its going to be in the YM building 4F. Take the escalators all the way up. Looking for a fun New Year’s activity? Look no further than the Daruma Doll Festival, in nearby Akishima. 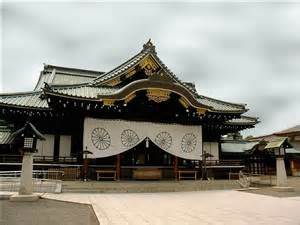 A visit to a shrine, within the first few days of the new year, is very important aspect of Japanese culture, known as hatsumode. 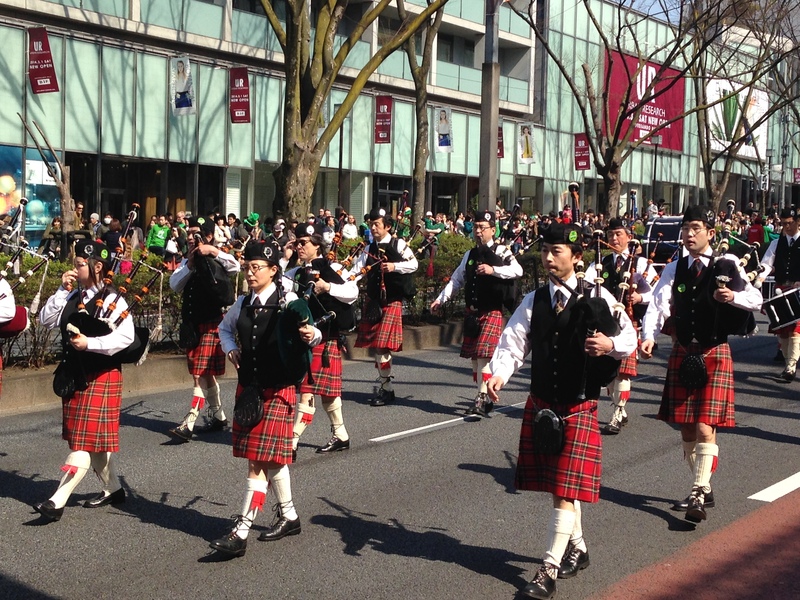 The lines to get to the front of the shrine will be very long, but we bypassed the line and had a great time wandering the festival. 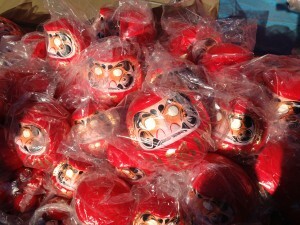 Daruma is a good luck doll for the upcoming year. You buy a new Daruma doll each year (there were many to choose from of all sizes), and color in one eye when you make your wish. If your wish comes true during the year, you color in the other eye. 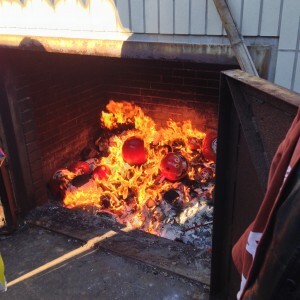 You bring last year’s Daruma to throw in the fire, which is part of the Japanese approach to the new year, “out with the old, in with the new”. 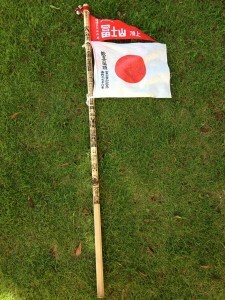 Also look for the kabura-ya, or arrow with a “turnip” shaped tip, for a fun souvenir. 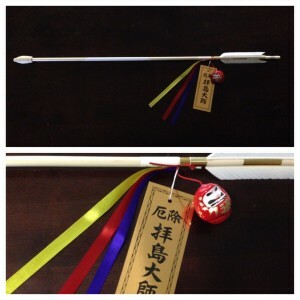 These are modeled after arrows that the samurai used, to attach messages to and shoot them into a fortress or other enclosure. 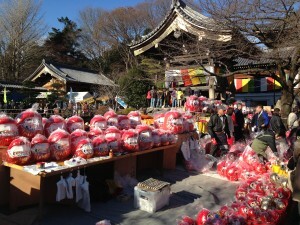 Now, they are sold at Shinto shrines at the new year, as protection from evil spirits. 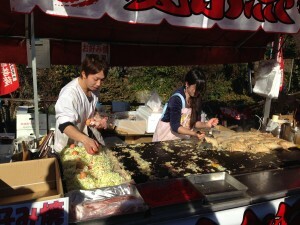 Of course, as with all Japanese festivals, there will also be FOOD! There were many vendor stalls set up selling your favorite Japanese street food; yakisoba, yakiniku, takoyaki, etc. Hours: 0900-1600, January 2nd and 3rd. Kidzania is such a clever concept and an absolute must if you have kids. Arranged like a city, the basic premise is allowing the kids to try out different “jobs” in the city and get paid for their work. There are over 50 jobs to choose from ranging from pizza maker, to flight attendant, to fire fighter, and everything in between. Parents are allowed to watch through the window at the different jobs, but are not allowed to participate. They really encourage the kids to be independent. Upon arrival you will be given a schedule card, you take this to the job that you are interested in and make a reservation. You can only make one reservation at a time. The groups are very small for each job, so I felt like we were getting almost one on one instruction all day. Each job lasts about 30 minutes. 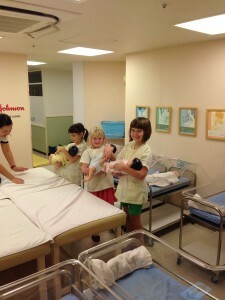 (Smaller groups of kids are easier to handle. If you want to go in a group with friends, prepare to not hang out together. All of the scheduling takes some coordination on the part of the adult, and many jobs only take up to 4 kids per session. Just a heads up). After the job, the kids are paid in “kidzos” that they are able to deposit into the bank, or spend for services, food or trinkets at the “mall”. They are also given a trading card at each job, to collect. 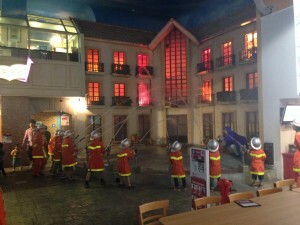 Kidzania is one of the best things we’ve done here! Check out the reservations page on their website, it will tell you if there is availability on any given day, or already sold out. 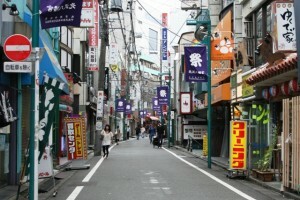 Like anything else, I would avoid weekends and Japanese Holidays whenever possible. Coincidentally, the website actually flags the Japanese holidays for you on the calendar. Wednesday’s are English days and most of the activities are presented in English. Even on a non-English day I think you would still get the gist of what was going on, though. There are two shifts; 1st shift is from 9:00 am to 3:00 pm, and 2nd shift is from 4:00 pm to 9:00 pm. You will only be allowed in the building during your shift. No matter your shift, arrive EARLY! The line can be hours long, even with a reservation. Activities are for children 3-15 years of age. There is a toddler room, for younger siblings, but younger than 3 yrs are not allowed to participate. There are also a few parent lounges. 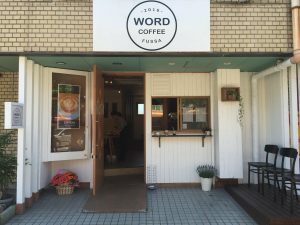 You cannot bring in your own food, but food is available to purchase. Many of the jobs include food, like the pizza maker. 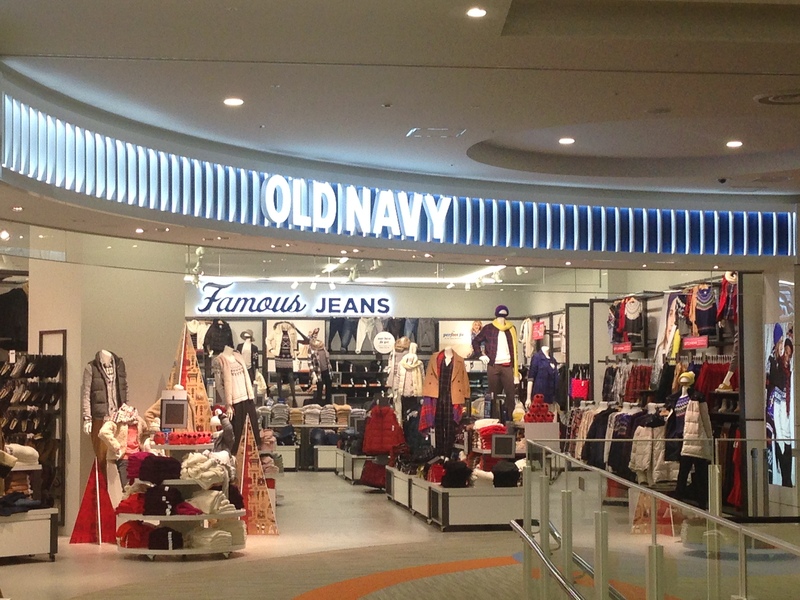 Kidzania is actually inside a mall, so you won’t see it from the street. Prices; the average price for a child is Y3450 and adult Y950, however there are several price changes due to holidays and there are also discounts if you buy far enough in advance, so check the website for specifics. 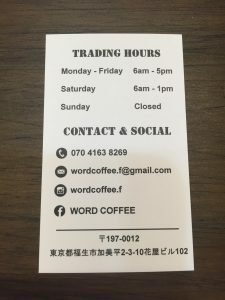 I had a hard time booking tickets online for some reason, but you can also purchase them from the Family Mart on base, this way you also have something tangible to hand the ticket person. Kidzania has a very good website, in English that will also answer many questions that you may have, I recommend reading up before you go. 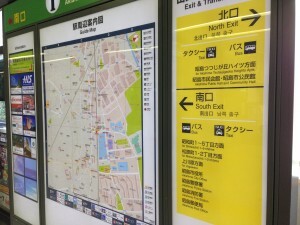 TRAIN: Toyosu station is the closest station, then it is about a 10 minute walk to LaLaport Toyosu, the Kidzania location. please check the LaLaport Parking Accesspage. Car height must not exceed 2.1ｍ. The first hour of parking is free. Guests who visit for the 1st Shift (9:00am – 3:00pm) receive 5 additional hours of free parking. Guests who visit for the 2nd Shift (4:00pm – 9:00pm) receive 4 additional hours of free parking. 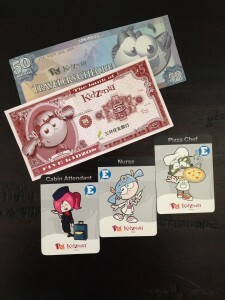 Please present your parking ticket for validation at the entrance of KidZania Tokyo. There is Japanese food and Japanese cuisine…Sushi-chu offers the latter – to the maximum delicious degree. 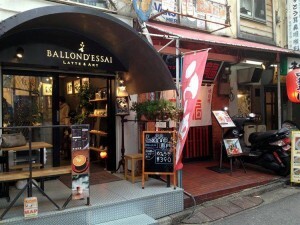 Prices are reasonable, the staff is learning English to serve their customers, and the atmosphere is cozy and relaxing. 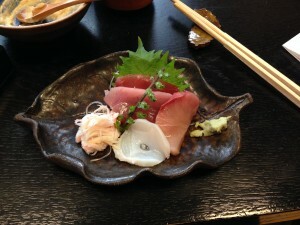 You can order from their set menu, or create your own experience by ordering a la carte. 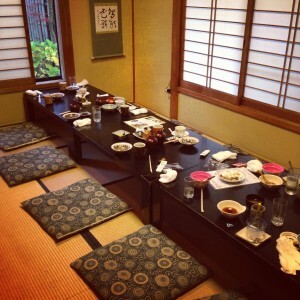 The restaurant is family-run and family-friendly (kids can even roll their own sushi). 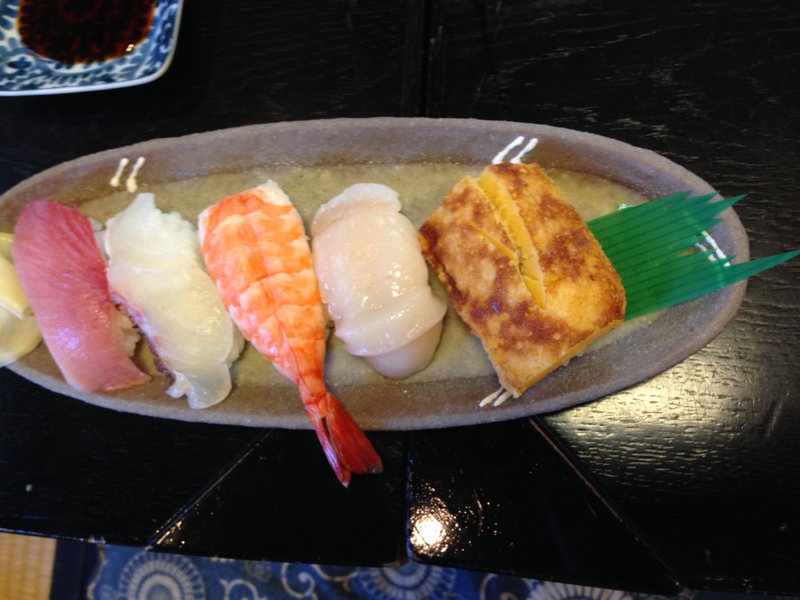 Sushi-chu delivers on taste, freshness, presentation – and most importantly, a welcoming staff. DIRECTIONS:This restaurant is about 20 minutes away from base, in Hachioji. Every year thousands of people make the trek to the top of Mt. 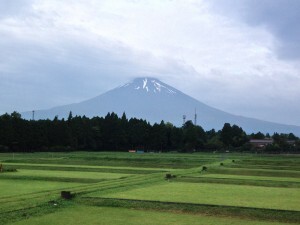 Fuji, Japan’s tallest peak. A hike up Mt. 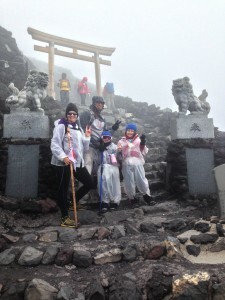 Fuji most popularly begins at the “5th station” and ends at the 10th station, or summit. The Outdoor Recreation group, on base, take many trips to Fuji every summer, but you must be 16 years or older to join their tours. 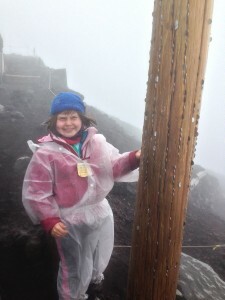 Though quite a challenging hike, it is very possible for children of all ages to make it to the top. 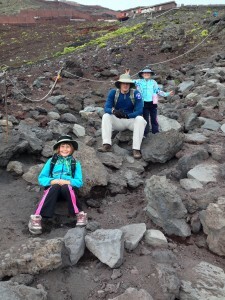 My daughters were 6 and 7 when we made our trip up Mt. 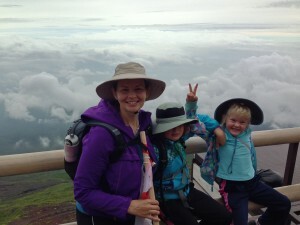 Fuji, so here are a few tips and suggestions for anyone considering this amazing adventure. The terrain is challenging, but not insurmountable. The 5th to 7th station trail is mostly gravelly rock on a steep incline. After the 7th station, it gets more rocky, and boulder-like. My girls almost did better than we did because kids are so agile with low centers of gravity! And closer to the top, it is almost straight up, like a stair case. Lets talk logistics. The hiking season is very short, officially only July and August, and sometimes the first few weeks of September. 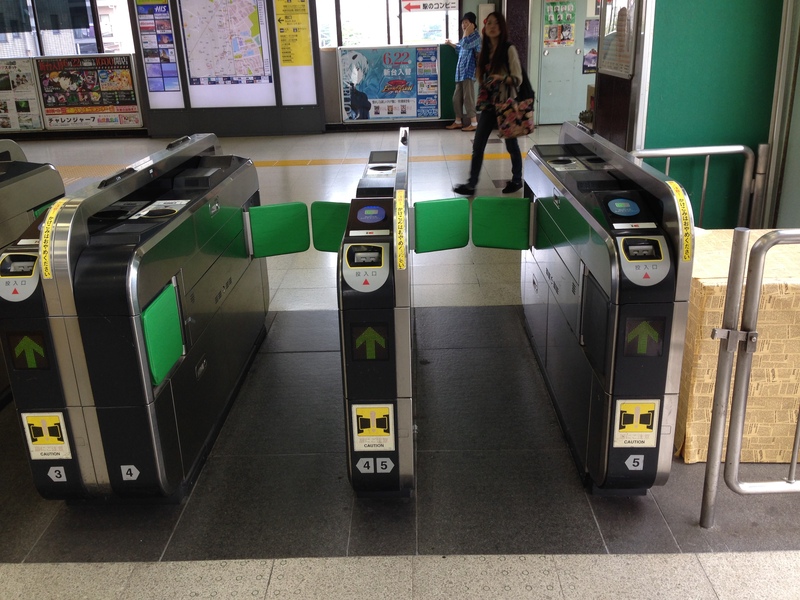 During July and August, the toll road that leads to the 5th station is closed to local traffic. 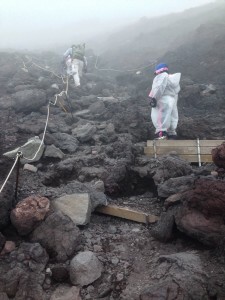 You must park and ride the shuttle to the 5th station to begin your hike. The Fuji Hokuroku is a great place to park and the shuttle runs every 30 minutes to the 5th station, and takes approximately 30 minutes. 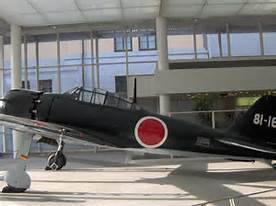 (See the schedule here; http://www.pref.yamanashi.jp/kankou-sgn/documents/jikokuhyou.pdf ) Cost of parking is Y1,000 and cost of the shuttle, round trip, is Y1,860 adult and Y930 child, cash only. 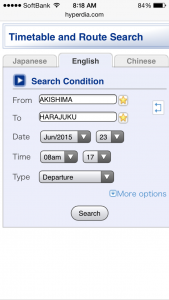 The shuttle runs every 30 minutes between 0530-2200 Sunday-Thursday and 0430-2200 on Friday and Saturday. You don’t need reservations for the shuttle, just show up and buy your ticket at a hut at the parking lot. 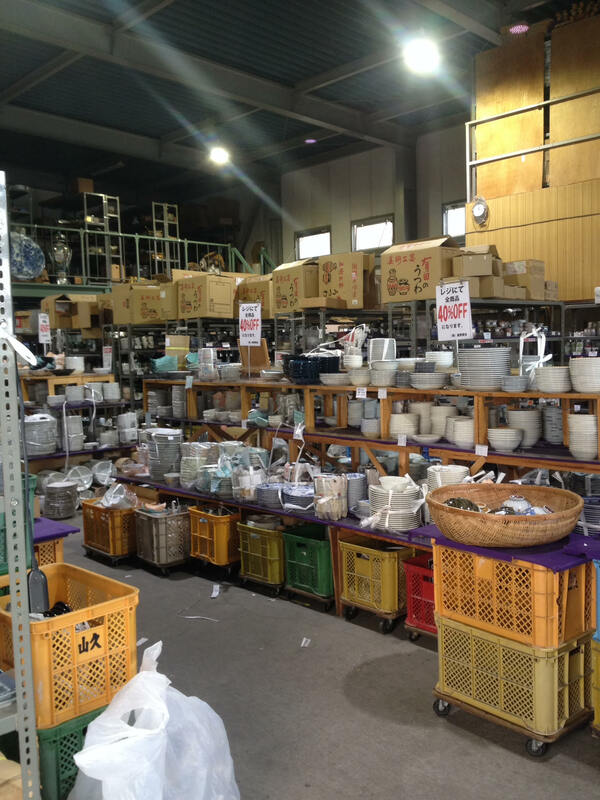 Be sure to take lots of yen, even more then you think you’ll need. If you are planning to buy food and water, everything gets more expensive the higher you get. 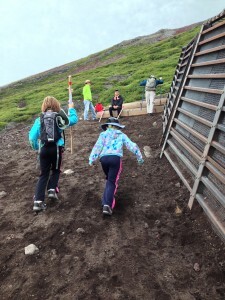 Don’t forget, the restrooms cost Y200 per use and you may want to purchase a souvenir hiking stick, as well. The initial cost was Y1,200 and you can buy stamps from each hut you reach. 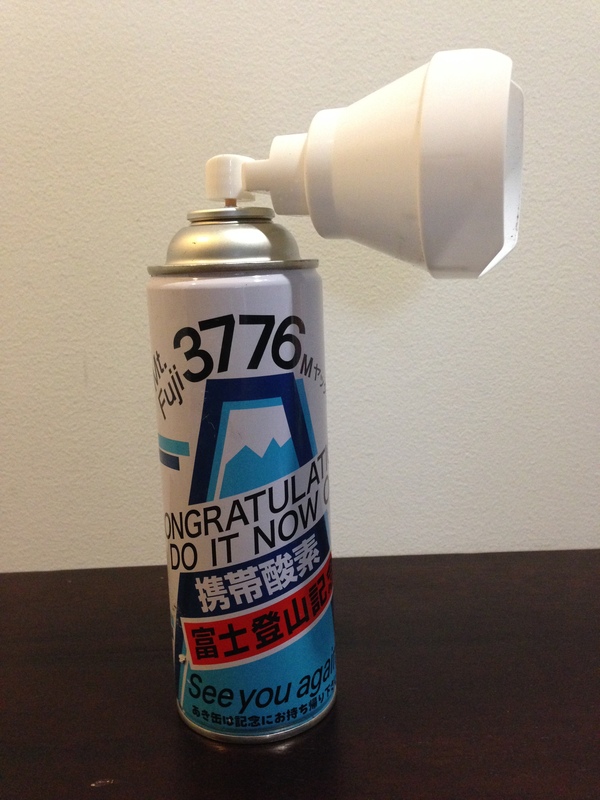 Each stamp costs about Y200-400, but it is such a one-of-a-kind souvenir, I’m really glad I have it. 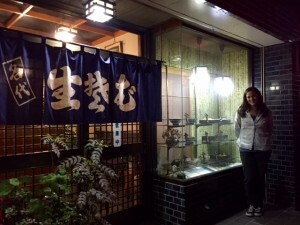 When you make it to the top, there is an actual town with a shrine, and a ramen shop, of course! You can circle the crater if you wish, which will add an extra hour to your trip. For us, getting to the top and down before dark was our goal. 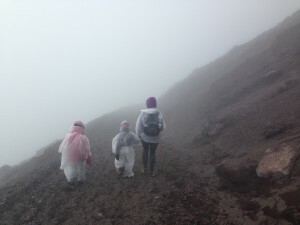 It took us 8 hours to reach the summit, we spent about 30 minutes at the top, and 3 hours to climb down. We took the 0500 shuttle and began the hike at 0530, and were back at the car by 1900 and home around 2100. So, plan for a long day. Also, throw some dry clothes in the car, for the return. Just in case! 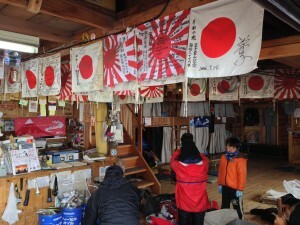 (You might consider spending the night before or after at Camp Fuji, this really cut down our drive time in the morning). This is a good website for general information. 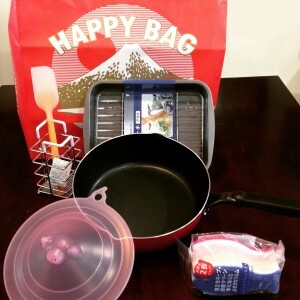 http://www.fujiyama-navi.jp/fujitozan/en/ And, definitely stop into Outdoor Recreation to pick up a map and a list of packing essentials. They are very knowledgeable about the mountain and you can even rent water gear, and adult hiking boots. We found some very reasonable hiking boots for our daughters at Sports Depo, across from Moritown mall. 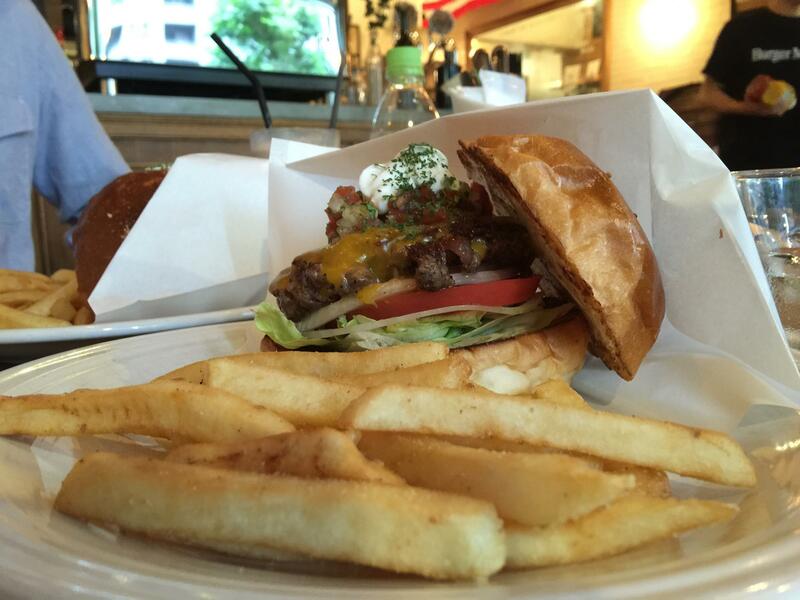 If you find yourself at the New Sanno and you have a craving for a great burger, then this place is a must. Without question one of the best burgers I’ve ever had. Burger Mania is a little cafe with eccentric choices, which include; the cherry cream cheese topped burger, blue cheese burger topped with Roquefort and Gorgonzola, or a seasonal peach topped burger, to name a few. They are perhaps most known for the Avocado burger and the BBQ cheeseburger. It should win extra points for having a vegetarian option, substituting grilled veggies and cheese for the meat. The average price of the burgers were between 900-1300 yen. Includes a small salad, and either onion rings or fries. 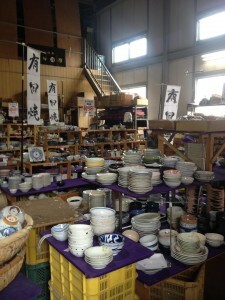 There is also a location in Shirokane if you are interested in going there as well. The Tokyo train system can be very intimidating to a newcomer, but it’s not that bad when armed with the right tools. 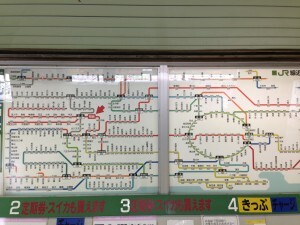 There are two train systems, the above ground lines and the underground lines (subway). 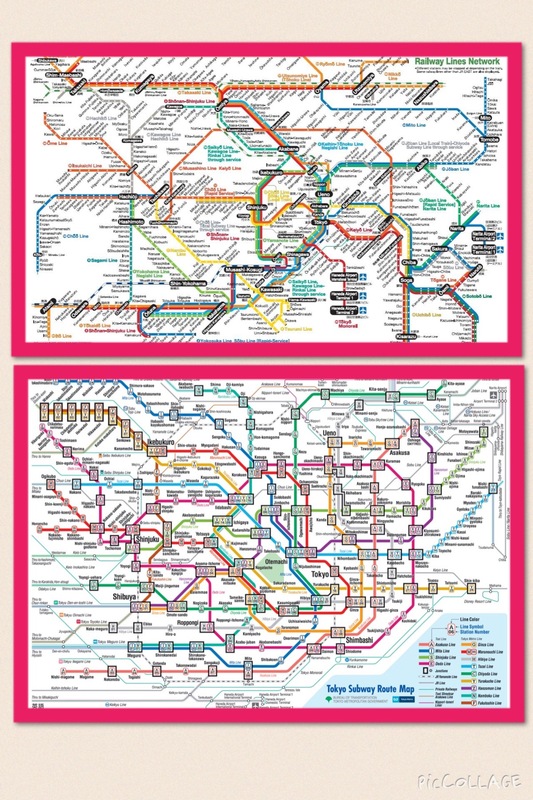 I was terrified the first time I saw the train system maps below! But, don’t spend too much time with the maps, the best way to navigate is with a smart phone. There are many apps to choose from, but my favorite is called Hyperdia. (**TIP- Just google Hyperdia.com on your phone and bookmark it rather than buy the app. It’ll save you money and I actually found the app not as efficient.) Then follow a few easy steps. STEP 1 Type in the station you are leaving from, where you want to go, and the time you wish to leave. STEP 2 A lot of different routes will display. Look them over and select your favorite. STEP 3 Each route will tell you how long the trip will take and how much yen it will cost. 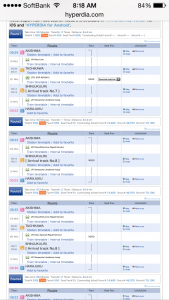 Also, which station and line to transfer to. 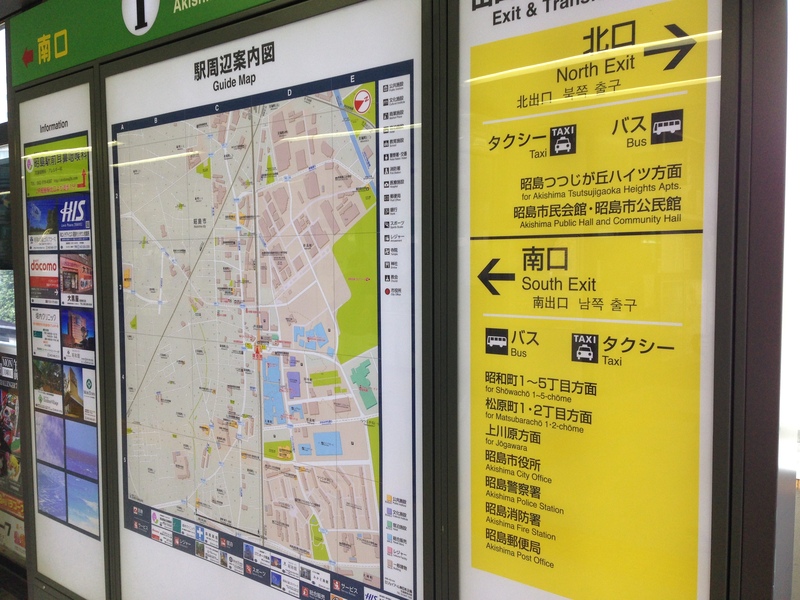 For example, when you arrive in Shinjuku station, look for a sign that says “Yamanote line”, and go there to wait for the final leg of your trip. 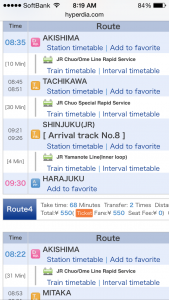 ***TIP- See under the Tachikawa station where it says “special rapid”? 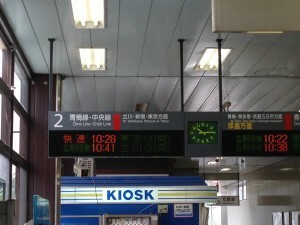 This is a faster train that does not make as many stops, so your travel time to Shinjuku will only take about 35 minutes. There is also a “rapid” which is not quite as fast, and then the “local” line, which will make every stop on the line. This will add at least 15 minutes to your trip. 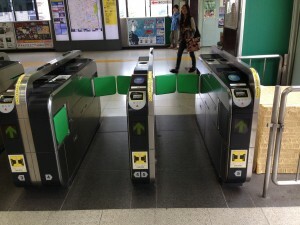 Enter through the turn style and proceed to the platform. Watch for the signs directing you to the correct track. Now, its time to wait. Look for the electronic sign above, it switches between Japanese and English and will tell you if you are waiting in the right place. 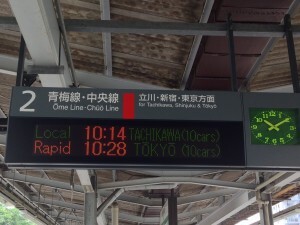 It also indicates if it is a Special rapid, rapid, or local train. When you reach your destination, look for the map near the exit and it will tell you landmarks in the area, and also which exit to take to get you where you’re going. 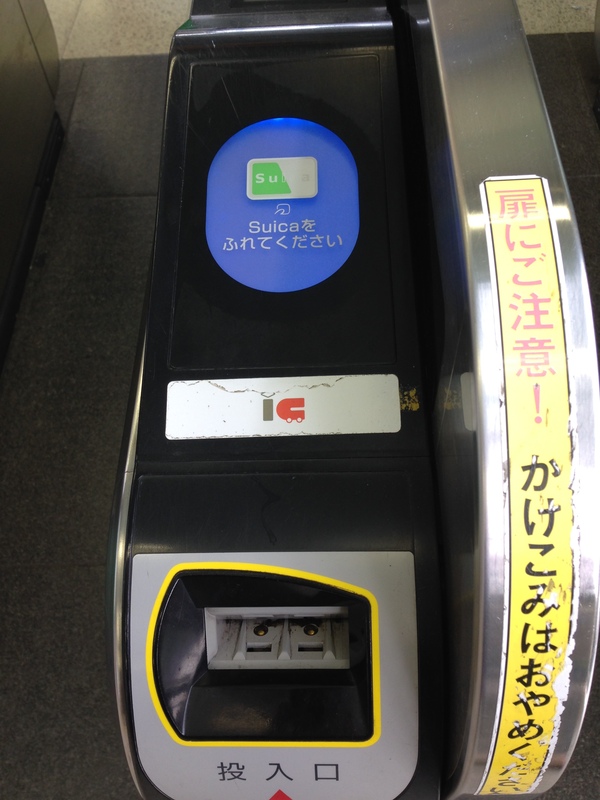 Some of the train station’s are massive, so this is really helpful. 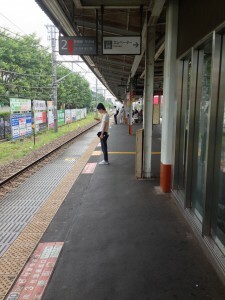 Train travel in Japan can be intimidating at first, but once you get the hang of it, the sky’s the limit! 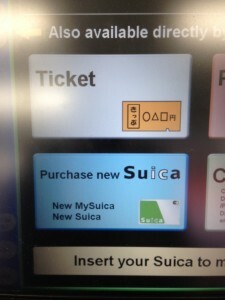 Yes, you can purchase an individual fare ticket, but life is so much easier with the Suica card. It is a re-loadable card that allows you to simply scan the card at the station, and it will deduct the money as you exit at your destination, just like a debit card. Here’s how you do it in a few easy steps! STEP 2 In the top right corner of the machine, there will be an “English” button, first select that, then choose the blue button titled “purchase new Suica”. 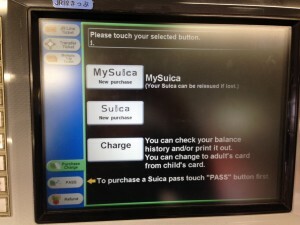 STEP 3 Select the middle button titled Suica. 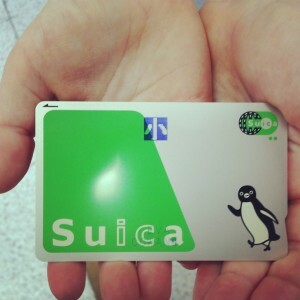 (NOT the one called My Suica). STEP 5 Insert your money (cash only) into the proper slot at the bottom of the machine. 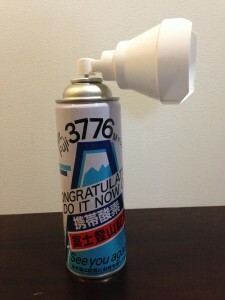 You are good to go! Approach the turn style with the green “in” arrow. 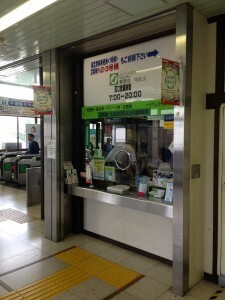 Place your card directly over the blue window and the gate will open. And that’s it! ***Don’t forget- this card is re-loadable. 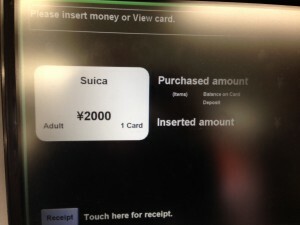 To check your balance, simply insert your card into any machine, and it will display your balance. 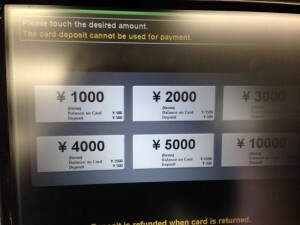 Then, add more yen if needed. 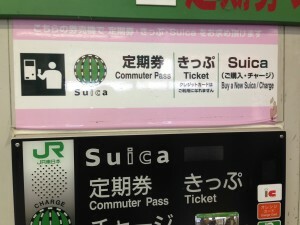 A children’s Suica card is also available for purchase, but you must go to the window with the child’s passport and purchase directly with an agent, since children travel at half fare. 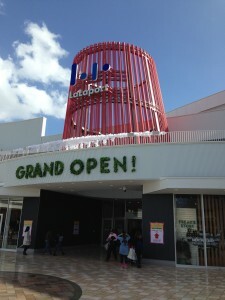 Not every station sells children’s cards , but depending on which side of base you live on, Akishima (at Moritown mall), and Haijima, are the closest options. ***Children under 6 years of age do not need train fare. Simply swipe your own card and walk through the turn style together. There is usually a wider lane with no turn style doors for strollers or wheel chair use. 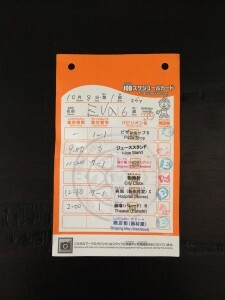 (The rules regarding children’s fares can be a bit confusing, but 6 years of age is when the child is considered school age, therefore needing train fare.The Japanese school system begins in April, so if your child turns 6 prior to April, 1st of the current year, you must buy a card. If your child turns 6 after April of the current year, you are good until the next April. Hope that makes sense!) Jamie Cowan, June 2015.